A senior Muslim Brotherhood official is denying the group's leader called for "holy jihad" against Israel in a newspaper article last week, even though strikingly similar language remains on the Brotherhood's Arabic website. The denial follows a call from the Simon Wiesenthal Center for President Obama to condemn the comments by Muslim Brotherhood General Guide Mohammed Badie, and for the United States to cut off all interaction with the Brotherhood until they are withdrawn. Egypt's Al-Ahram newspaper quoted Badie calling for "holy Jihad" because "the Zionists only understand force," and saying that justice cannot be attained "through the corridors of the United Nations or through negotiations." Badie's statement "confirms our long held view that Egypt's Muslim Brotherhood is the most dangerous anti-Semitic organization in the world today," Wiesenthal Center leaders Rabbis Marvin Hier and Abraham Cooper said in a statement. Brotherhood spokesman Waleed Shalaby denied Badie made the statement. "The Zionists only know the method of force. They will not step back from transgression, unless they are forced to. This will only be by holy Jihad, and enormous sacrifices and all forms of resistance. One day they will be certain that we will choose this Way, and raise the flag of Jihad in the Way of God. We will go forth to the field of Jihad." Jerusalem's Al-Aqsa Mosque is "the life of the Islamic Umma is not just memories of history time will erase with the blowing winds," Badie said, "nor will Muslims forget it through long occupation, but Jerusalem and Al-Aqsa Mosque are buried in the depths of Muslims, and love for it is in the veins of the faithful. ... By God, it is dearer to us than our lives which we have. For its sake, a Muslim will not spare his life in sacrifice for it." In a subsequent statement issued Sunday, the Wiesenthal Center called the Brotherhood denial "laughable," noting Al-Ahram is government-owned. As we've noted repeatedly, the Brotherhood has a long track record of issuing benign-sounding statements to English-language audiences, but speaking in more radical terms in Arabic. For example, during Egypt's first electoral campaign since the fall of dictator Hosni Mubarak, the Brotherhood removed portions of its bylaws which call for "establishing the Islamic State" from its English-language website. But in a speech, Badie reminded supporters of the path Brotherhood founder Hassan al-Banna spelled out to develop "the rightly guided caliphate." The Brotherhood struck a seemingly positive tone after American commandos killed Osama bin Laden, telling English language audiences "one of the reasons for which violence has been practised in the world has been removed." But to Arabic speaking audiences, bin-Laden was referred to with terms of honor, such as Sheikh and even "shaheed," or martyr. It condemned the American attack as an assassination and reinforced the right to "legitimate resistance" against occupation in Afghanistan, Israel and elsewhere. It is in this context that the denials of Badie's statement by an Egyptian government media outlet, and on the Brotherhood's own website must be seen. The Brotherhood is Egypt's undisputed power today, with President Mohamed Morsi resigning only after becoming a candidate for president. It cannot be ignored or dismissed as idle chatter when his colleague, Badie, calls for holy jihad to liberate Palestine. "We are not dealing with a YouTube video or a lone extremist Imam, but a call to anti-Semitic violence by a man who has tens of millions of followers and leads the organization that controls Egypt's future. It cannot be business as usual in Washington when such an assault is launched against the Jewish people," the Wiesenthal Center statement said. Given the support the Brotherhood enjoyed from Islamist groups in America, and the fact that several are direct descendants, the Muslim American Society, Islamic Society of North America and Council on American-Islamic Relations should denounce the comments, too. How so much generous they are , that hateful generosity that has filled our life with lies . 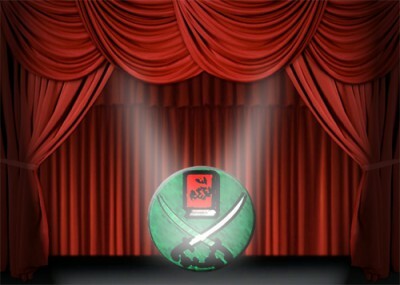 Let America's adm. that supports the Muslim Brotherhood , enjoy the pertaining outcome of its foolishness .